Saturday we ventured out for White Sands, NM. We had high hopes for some sand sledding. I was expecting it to be like this. Only there is this phenomenon in Texas we recently discovered called Wind Season. Who knew? (Yes, knowledge of this would have been helpful in planning our vacation). So when we arrived at White Sands we discovered something called a sand storm. And unlike a snow storm, sand storms hurt. Amazing how wind gusts pelting sand onto your face doesn’t exactly feel good. I had envisioned the kids loving life as they went sledding in nice 70 degree weather. But, they weren’t big fans of the sand blasting. Thankfully though we went with our close family friends and aunt and uncle. So for the 4 hours of driving to nowhere, they got to enjoy time with their new friend. And I gotta say, the kids were great. They sang songs and played phone and make believe. It was a huge blessing. And even though it wasn’t exactly like I thought it would be, I am glad we went. Because I have never seen sand like this and it gave me an appreciation of what it would be like to walk in the desert. Whoa, what an experience! Those are some good kids. Your pictures look like some that Keith has sent of the sand storms in Iraq. What a neat thing to do! I've never heard of it. Sand storms, sounds like a good remedy for wrinkles! I just wanted to let you know that I nominated you for the Lemonade Award on my blogs . I appreciate your content of being a Christian and still being so honest and funny! What a fun idea! 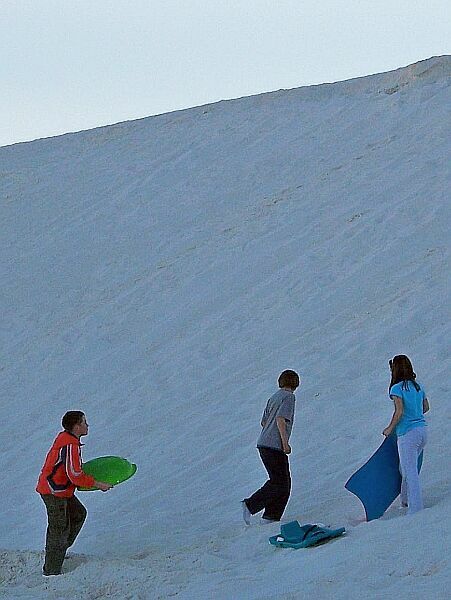 We used to do something similar on the little dunes on the beach the hill looks great. Well, at least you are making memories on this trip. You have such a great sense of humor, so I know you'll appreciate both the good and the bad that comes from traveling with three little ones. Can't wait to read some camping stories!